Experience Hawaii like a native! If you awaken before 7 am, walk down the beach to the right for 1/2 mile and see turtles sleeping on the sand. Mornings are also great for watching surfers on three reefs (Silva Channel, Hammerheads, Walls) visible from the beach (but we also have binoculars in the house). The best times to swim and snorkel are during low tide, generally, before 10 am and after 5 pm. In the evenings, enjoy a colorful sunset over the ocean. During the winter, watch for whale spouts and jumping in front of the horizon. It's no exaggeration that Mokuleia is one of the best beaches on Oahu for natural beauty, wildlife and privacy. The cottage is on Crozier Drive, which is an exclusive private one-lane road with multi-million dollar second homes mixed with primary residences on the oceanside and two-acre agricultural land on the mountain side. Locals consider Waialua "country." Miles of quiet beaches for walking and shell collecting. This is truly a special area of the islands, remote yet only a short drive into the world famous surf town of Haleiwa, and just a 45-minute drive to the excitement of Honolulu and Waikiki. This lovely guest cottage on a gated beachfront lot is shared with the owner's home. There is an enclosed outdoor hot shower and toilet (in addition to the 1-1/2 baths in the cottage). Comfortably furnished with beautiful landscaping, and only steps to the quiet, secluded, sandy beach in this very quiet neighborhood, away from the traffic and congestion of Sunset Beach. Free WiFi is available in the house and yard. There is a guest parking space on the driveway. Guests can use the gas BBQ grill, 4-5 beach chairs, boogie boards, life jackets, snorkels and googles, plastic beach toys, beach umbrella, and beach towels. There is a fire pit to roast marshmallows at night (fires are illegal on the beach). You can collect drift wood on the beach to burn and there are long marshmallow sticks in the pantry. This is my family's home. My mother lives in the separate main house. Since I live in Texas, and use the 'Keiki Hale' (children's house) just a few weeks a year, we rent it out for short-term vacations. This property will always stay in my family as my husband and I plan to retire here and my kids love it. You will, too. Our beach is exceptional for its beauty and privacy. It's great for snorkeling and swimming because there's a reef that protects the beach. We live on a private residential street that is quiet (except for the occasional wild chickens). This is the place for you if you want to sit and read on the beach or be more active. You can hike at Kaena Point, walk and jog on Crozier Dr., swim and snorkel with turtles directly in front of the house, skydive at Dillingham Air Field, watch polo on Sunday afternoons from April to September, and ride horses on oceanfront trails. Of course, you can also surf or take lessons in Haleiwa (5 miles away). Outdoor hot shower with sink and toilet. Relaxing and beautiful ocean front cottage! We loved everything about our stay, the cottage, the grounds and the ocean as our backyard. We saw whales from the beach everyday and it was a great place to relax. We couldn't believe the view from inside the cottage or from the back porch, where we were surrounded by beautiful tropical plants and trees with an ocean view. Mahalo! Well maintained cottage on a beautiful beach! Quiet, private beach cottage on my favorite beach in the world! What more could you ask for? During our stay we had a horrible storm, 60 mph winds, high surf and torrential rain. The house held up to the test of the storm with no leaks or drama. We had to spend most of our time inside sadly but enjoyed playing cards and games that were there. I look forward to our next visit. We had a wonderful time at this little cottage. The property is on a quiet lane, with more chickens and bicyclists than cars. We had the property to ourselves and walked every morning on the beach. Excellent snorkeling for good swimmers (loads of fish!). Not that strong of a swimmer? Go to Shark's Cove a few miles away for a more protected site. We saw turtle tracks on the beach -- very cool they looked like ATV tracks. Also, very fun to watch the surfers (we were there for the higher February waves). The cottage is well-equipped for outdoor activities with snorkeling gear, boogie boards, surf boards and a kayak. The outdoor shower was very nice for washing off after a swim or barefoot walk on the beach. There were just two of us, but the cabin is perfect for families with a door separating the sleeping area from the open kitchen/living/dining room. We booked this property because of its location and how many people it could sleep. What we found was a beautifully landscaped property with a long stretch of lawn that headed down to the beach. Perfect place to take your favorite beverage, go through the beach gate, sit on the steps with your toes in the sand and relax watching the waves. There was a fire pit on the property just on the other side of the beach barrier with plenty of fuel from the driftwood that could be gathered from the beach. My favorite was the outside bathroom with an open ceiling hot shower! We had 4 to 5 people staying with us so the extra shower was great. We weren’t in the main house on the property but the cottage was a roomy open floor plan including the living, dining and kitchen areas. Since I was preparing for a wedding, being able to spread out in the dining area with all my decorations, rental items for the venue, and beverages was a life saver! An extra bathroom with washboard tub and washer/dryer came in handy right off of the dining area, too. Two full bedrooms with closets and dressers had room to spread out. We didn’t lack for kitchen needs. There were books, movies, games and plenty of places to hang your wet towels inside and out. A couple things that we did miss was there was one, no iron. And two, I didn’t find any beach towels (they could have been some place I didn’t look). But, these were minor inconveniences that were listed as some of the amenities. I would definitely go back to this rental again. The next time, no wedding hustle and bustle with wedding guests coming and going, dropping off supplies they helped transport. It will be to totally enjoy and relax because this location is the best! So glad you had a great time. Extra beach towels should be in the green Chinese cabinet in the hallway but my housekeeper may have forgotten to put them out—I’ll remind her. We thoroughly enjoyed our staycation at this beautiful property. We live on-island and enjoyed this cottage and that it was right on the beach. It was clean, quiet, and the beach is peaceful (not overcrowded like many of our beaches). It was convenient yet out of the way. It's not far from the popular Haleiwa town. We definitely would stay here again. 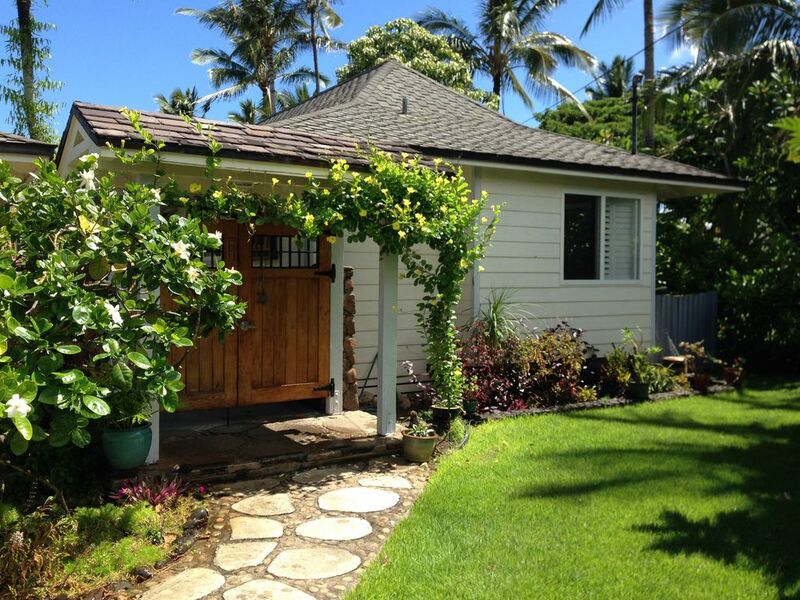 This property is located 5 miles from Historic Haleiwa town (the surfing capitol of the world). It is on a private residential road with minimal traffic, away from the congestion of Sunset Beach. The beach is protected by a reef that makes for wonderful swimming and snorkeling. We don't have the huge waves and undertow of Sunset Beach and we don't have jellyfish like at the beaches at Laie. Mokuleia is truly the best beach on Oahu. There are two houses on the property. The rental house is closer to the road with an ocean view from the patio. The main house closest to the beach is used by me when I'm in town. My mother stops by weekly to work in the yard. My neighbors would appreciate quiet after 9:00 p.m. We do not allow parties, weddings or camping. Check-in is 4:00 PM, check-out is 11:00 AM. The house will be reserved for you as soon as the $500 security deposit is received. The $500 deposit will be returned 14 days after you leave (minus any damage to the property or extra cleaning fee for excessive amount of sand left in the house). The "subtotal" (daily rate + taxes + cleaning fee) is due 30 days before your arrival date. If today's date is less than 30 days from your arrival, the "total" amount is due ($500 security deposit + subtotal). Once HomeAway.com receives your $500 security deposit, you will receive a standard rental agreement. You will need to download the HomeAway app to your cell phone to receive instructions about how to get the key for the house, general information letter about the house, restaurant and sightseeing suggestions, and directions to the house from the airport.